The Adventures of Tintin: The Secret of the Unicorn, based on the classic Belgian comic strips by Georges Remi, will be the first Steven Spielberg-directed feature film since Indiana Jones and the Kingdom of the Crystal Skull (2008), and hopefully the first good once since Munich (2005). The last time we saw official images from TinTin was way back in the annals of November. Today, we finally get to see both the United Kingdom and domestic posters for Secret of the Unicorn. Check back tomorrow for the first official trailer. The second poster is about five times more awesome than the one up top. Instead of looking like Tintin is pretending to be a badass as he slow-motion walks away from all kinds of pirate ship and plane-exploding action, it looks like he's just being a smart, careful guy on an incredibly creepy and atmospheric dock. What's more -- of course he has a long, flowing coat on! It's probably cold out! And damp! Look at all that fog! Good for him. 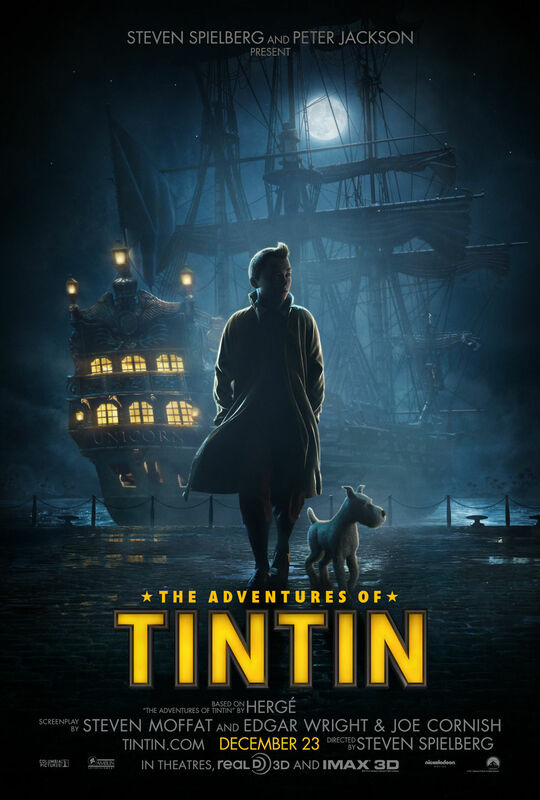 The title of both posters now reads The Adventures of Tintin instead of The Adventures of Tintin: The Secret of the Unicorn – does this mean that the title of the film has changed? Honestly, we hope so. Nine words is about five too many for a property most Americans have never heard of. Simplicity, in this case, seems the most effective route. The Adventures of Tintin: The Secret of the Unicorn combines a number of stories from Tintin canon, including The Secret of the Unicorn, The Crab with the Golden Claws, and Red Rackham’s Treasure. For those ScreenRanters generally unfamiliar with Tintin: basically he’s young journalist who, along with his trusty terrier Snowy, gets into wide variety of adventures (hence the title), which delve into an even wider variety of genres (including, but not limited to, fantasy, science-fiction, swashbuckling, mystery, noir, and political thriller) - all with a healthy dose of both slapstick and satire. One last thing -- it'll be interesting to see how well Spielberg does against Spielberg, as both this film and his war drama War Horse will be in theaters at the same time. Our money's on Tintin. 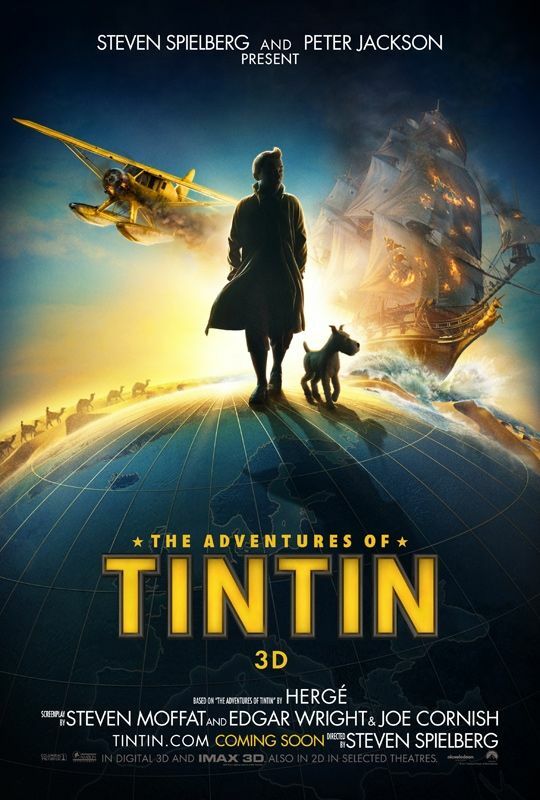 The Adventures of Tintin 3D probably has more talent behind it than any other film out this year, as it’s directed by Steven Spielberg, produced by Peter Jackson, written by Edgar Wright, Steven Moffat, and Joe Cornish, and stars Jamie Bell, Andy Serkis, Simon Pegg, Nick Frost, and Daniel Craig. Look for it in theaters December 23rd, 2011, just in time for Christmas. And, again, remember to check back tomorrow for the trailer!